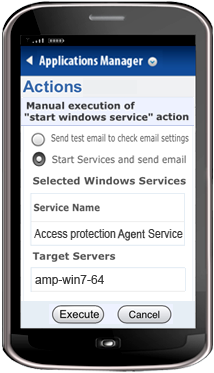 Access Applications Manager anytime, anywhere with our new Mobile Web Client. 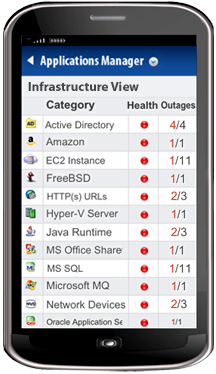 ManageEngine Applications Manager's mobile web client offers a comprehensive, powerful, yet easy-to-use application monitoring solution. 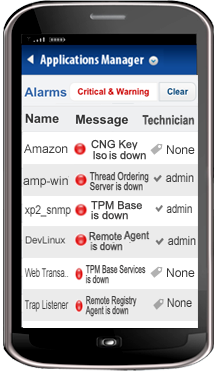 Optimized for all types of smart phones available in the market, the Applications Manager Mobile Client provides a convenient method to track critical applications, perform actions, receive alerts and identify issues quickly and easily from any location. The different monitor views in the mobile GUI can be configured such that all relevant diagnostic and resolution information is readily available and easy to use. The mobile client is adapted for efficiency on smartphones, and switching between customized views is just a few clicks away. Get an overview of all your monitors based on category. Find out the overall availability and health status and outage info. Customizable dashboards for users who want a bird's eye view summarizing relevant information alone. Infrastructure view displaying a list overview of all the monitors classified into various categories. This view enlists the overall availability and health status and their health outages. Monitor group view lists all the configured top level monitor groups, giving a clear picture of the day's availability and health status of a monitor group or subgroup and the outages. This makes it easier to track if one of the monitors have failed. You can log in to the applications to get timely notifications with critical and warning alarms. You get detailed listings of 'Down' or unavailable monitors along with information on how long the monitor has been down. Added functionality with lists of actions types associated with each monitor. Take corrective actions like start, stop or restart and windows service actions like Amazon Ec2 instances, VM Actions or execute any script/batch file. Get a clear picture of the day's availability and health status of a monitor group or subgroup and the outages. Easily track if any monitor has failure. The mobile client's search Bar is a convenient way to search using keywords for monitors or monitor groups along with their availability and health status. Get an overview of all your monitors based on category. Find out the overall availability and health status and outage info. The seven monitoring views in the mobile client of Applications Manager are tailored to meet the end user's needs and provide you with effective portable monitoring of your environment.